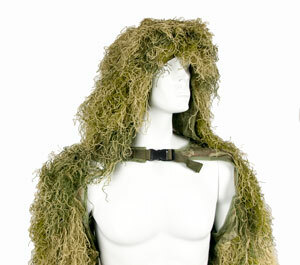 We've just had in some of the MOD I Recon Ghillie's with the integrated hood. No need to add anything, just pull it out of the bag and it's good to go. * Allows easy front access to pockets and pouches. * Can be worn with back pack. * Specially selected colour to maximise concealment. * Made from lightweight and breathable materials. * Poly-prop thread, will not support flame. * Elastic to attach natural foliage. * Come in compression bag.